Ian's Quest: Is computer art really art? Is computer art really "art" in the traditional sense? That's a tough question. It's hard to define computer art, because it lacks solidity. After all, it's not really anywhere in a form commonly accepted in auctions. Even in a display it's only a transient visitor to a few RAM chips. And printed—well, what printer can capture all of the details of a screen? Computer art certainly demands all of the same skills, learning, effort and talent of other art. But unlike all the rest of them, it has no permanent existence. On disk, it's merely a collection of magnetized oxide particles, prey to whatever cosmic mishap befalls disk data. Even if it remains stable, it is still more subject to change than any other form of art, since a single-bit adjustment creates a new piece. And since it's copyable, there is no such thing as an "original" as befits a great painter. Signed bitware, unchangeable artistic masters on disk? Not yet, anyway. Until then, "computer art" remains more of a craft than an art. I'm no great shakes as an artist. Everything I draw seems to come out cockeyed. It's even worse with software. Doesn't matter what the drawing tool is or how many amazing features there are either. I understand art quite well: the process, perspective, viewpoint, the mechanics, all of that. It just doesn't translate itself well onto paper (or screen) for me. However, that doesn't spoil my fun. Like most folks, I doodle, and given a computer paint program, I do it electronically. I've met others who do this quite proficiently and can whip up some rather impressive screens. The polite term for their work is "art," but I don't think the electronic Etch-A-Sketch stuff I produce deserves the distinction. I never managed to enchant any lady up to my garret to see my computer etchings, either—Susan was far too canny to fall for that line. Part of my excuse for poor artistic performance may be valid for a lot of people with a higher level of talent, but who experience difficulty with computer drawing: The primary tool is inadequate, not the software, the mouse. I can do much better with a light pen and even produce something passably attractive with a digitizing tablet. But the mouse seems particularly unsuited for fine, freehand drawing. Maybe it's because it doesn't feel like a pen or a brush—or any of the vertically held tools we're taught to use. Or maybe it's because most mice have their rolling ball (which represents the pointer location as well) below the palm of your hand, rather than at the fingertips, where a pen or brush works. Ever try to sketch something with a mouse? My dog could do better holding a crayon in his teeth! It sometimes seems that whatever I draw looks, at first, like a child's crude efforts. In order to compensate for the clumsiness of the mouse, I have to depend on software features such as zoom-level tools to correct straying lines and clean up nasty clumps of pixels; curve tools (Bezier and b-spline) to make lines look less like snail trails; line ellipse, frame and so on for polygons. In art software, the more features, the better I like the program. There are two sorts of art programs around: draw and paint. This column's about the latter; I'll do draw programs some other time. Basically the difference is that draw programs deal in "objects" and vectors (as most CAD programs do) and paint programs deal in pixels and screens. There is some overlap in functionality and features, but not enough for my taste. 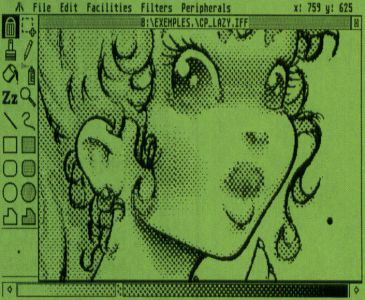 MacPaint is the archetypal paint program from which many ST paint programs derive (as well as many PC paint programs). In it several important ideas were developed, as well as many icons, features and styles that are today accepted as standards. 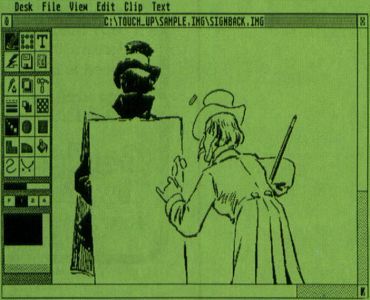 DEGAS, one of the first such ST programs, and still one of the best, owes only some of its lineage to MacPaint. 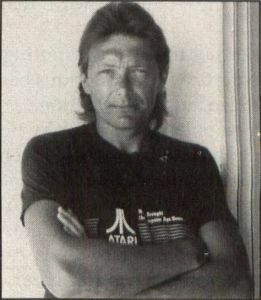 Author Tom Hudson took his own course, especially with DEGAS Elite. He prefers the dual command-screen/drawing-screen mode rather than putting all of his tools in the one screen with the work area, but the basic tools are the same. However, DEGAS is a bit long in the tooth these days and suffers from three main weaknesses: the rigid picture size (always exactly one screen large), the lack of curve and spline tools and the inability to cut non-rectangular blocks. These could be remedied, along with the addition of new tools and features, to bring DEGAS Elite back to the fore, but I personally don't believe Electronic Arts has sufficient interest in the ST market to make such a commitment. I remember when I was working on the manual for DEGAS, back in the ST's Paleozoic. While learning the features, I spent hours and hours working on a "painting" of a wasp—lots of (for me, anyway) detail meticulously transcribed from a photograph, background scenery lovingly added in at zoom level. I was so proud of it that I offered it to Batteries Included (BI), the company that originally marketed DEGAS, to include on their disk as a sample picture, free of charge. Some hope. Marty Herzog of BI smiled condescendingly and showed me some of the samples they already had from people with what appeared to be an endless reservoir of talent in that area. As I watched the slide show of their efforts, my wasp became flat, uninviting, lifeless. I heaved a great sigh and went back to the writing, leaving the art to those who do it best. So what? Well, being an artist is one of those hidden dreams that lurks deep inside me. Despite a propensity for drawing stick men and a sense of perspective only an alien could appreciate, I love to draw. Inside me lurks the heart of Picasso, Rembrandt, Da Vinci. That's why I can never avoid the lure of new art programs—in this case HyperPaint from Atari UK, Touch-Up from Migraph and two from Human Technologies in France: Lazy Paint and Rough. A real international sampling. HyperPaint one might call Atari UK's answer to DEGAS. It is a competent paint program that adds a few features and enhancements to DEGAS but not everything that is needed. It supports GDOS and the manual has a rather good description of GDOS, ASSIGN.SYS and the installation process. HyperPaint has Bezier curves, save/load .IMG files, ten workscreens (each of which can have its own palette), irregular block cut/copy/paste and a few other features, as well as the standard draw/paint/fill functions we know and expect. The interface is a little jagged and at times awkward. For example, if you choose Quit or click on the close box, you can choose to save the current workscreen (only!) or quit, but not cancel. It's an easy way to lose a lot of work. Also, you don't print from within the program—you do so through a separate output program, from which you can load or print a file. 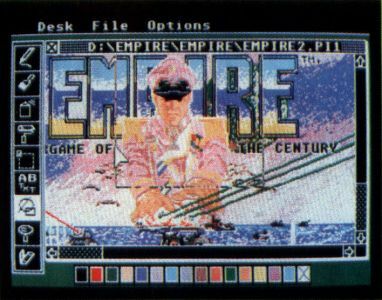 Atari UK failed to provide any sample pictures in any format, a weakness for new users who'd rather tinker with predrawn work than attempt their own masterpieces before mastering the program. Facing a sparsity of paint programs, HyperPaint would be high on my list. But with so many others around—even some darn good public domain offerings—it doesn't offer enough novelty to recommend. It needs more chrome, more shine. Touch-Up and Lazy Paint (which I believe is also known as ZZ Paint) are monochrome paint programs. This is unusual in itself: Publishers have tended to focus on the ST's color abilities and have treated monochrome as a poor cousin. Paint programs that have worked in mono have simply done the same things they do in color, without regard to any of the special needs and abilities of black and white. Touch-Up also works on a color monitor, in low and medium resolution, but only provides black and white "colors." Lazy Paint works strictly in mono. Monochrome, by the way, isn't simply trading colors for higher resolution. It's a different metaphor completely. It's like the movies. A lot of movies shot in black-and white were so done because no one had color technology. On the other hand, a lot of directors chose black and white as their medium, despite the availability of color, because it offers special effects unattainable in color, and it also requires a different type of craftsmanship. Monochrome art is like that: to novices it looks like it offers less. But even if it's a lot more demanding, the results can be more satisfying. In monochrome, it's much easier to do grey-scale gradations, and this should be an integral function in any mono-paint program. Many color paint programs provide a similar feature that permits automatic gradation or shifts, so it's reasonable to expect the same thing in mono-paint programs. If not done in actual grey scales, then it should be possible through patterns. Touch-Up is one of those "Ferrari" programs: oodles of chrome, features and functions to complement the usual lot of commands. One example is the "map to black" option that translates color pictures to monochrome. Simple enough idea, except that Touch-Up offers six methods of mapping, with variations. Migraph doesn't do anything by halves. Other extra features include B-spline and Bezier curves (with nice B-spline parameter settings); a .IMG file viewer; .TIFF format support; a dynamic screen locator in zoom mode; measurements in inches; centimeters or pixels; fill patterns in 75, 150 and 300 dpi; GDOS support; many, many text, clip and display options; plus a whole lot more. A lot of thought went into this program. There are some problems with Touch-Up however. One is the manual: First, it has no index—an inexcusably amateur oversight. Without an index, it is close to impossible to learn what Touch-Up can do without reading the manual over and over again. Second, the manual is poorly written, using the passive voice and many inexact terms or phrases. I'll give it a better rating than most MichTron manuals, but it could do with improvements. Other weaknesses include the lack of multiple magnification levels (only 2x and 4x), the slowness of the redraw and the glacial response time of some features (although a "lightning" mode is available, with fewer features), only one work-screen, the Undo key doesn't work and an awkward or poorly conceived user interface—for example, the nonrepetitive arrow buttons in the text-size dialog box and no grey scales. These faults combine to make what should be one of the best art programs around, merely a good program. Migraph should, and could, do better. I hope they heed this and upgrade both the minor program flaws and the manual. Lazy Paint is a different type of program. It's a lot simpler, with fewer bells and whistles, but it has quite a few special items, such as three different grey-scales pattern bars, pattern search, portrait to landscape toggle, .PI3, .IFF, Post-script and .IMG file support, disk information tools, direct scanner support, user-definable filters for the clip box or the entire image and pointer coordinates displayed. While the basic drawing tools in Lazy Paint are pretty much standard, the program is clean, smooth and easy to use. The few bits of chrome they chose to add are well thought-out and useful—not merely for show. It hasn't the muscle of Touch-Up, but it's still a nice program and one to consider for mono-only systems. Rough (or ZZ-Rough) is France's answer to Neochrome. It's a low-resolution paint program that approaches the idea from a different angle. 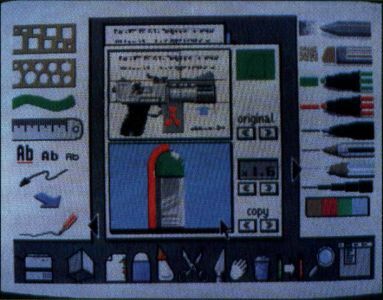 The program uses the artist's sketch pad as the metaphor and each page (screen) can have its own palette. They also provide pens, pencils, markers, chalk, stump, tracing tools, brushes and similar artist's tools. It's an unusual way to work but rather more intuitive if your perception hasn't been spoiled by other art programs that more or less ignore the graphic arts standards in their interface. Rough has several uncommon commands, including the viewing of black lines only, breakdown of a painting ("page") into black, yellow, blue and red (for producing color separations), animation of pages, 3-D arrows, flexible ruler (for curves), merge sketches and mask parts of sketches. It also has GDOS support. More remarkable is Rough's ability to handle CAD 3-D V2 objects—retrieve, manipulate and copy the image to a sketch page. This almost allows Rough to be a combination draw/paint program! Rough's file-handling capability includes Neochrome, DEGAS regular and compressed, Art Director and GFA Artist formats. Rough is the best graphic-arts paint program I've encountered, and well worth getting when it comes, translated, across the ocean. If bundled with its sister program, Lazy Paint, it will be a dynamite package. Unfortunately, I've only seen them as beta English-language versions, but what they've done so far is impressive and exciting. There is a lot of good software in Europe. In the meantime, I'm going to continue to doodle with my artware—maybe even find a few more to compare—and play that highly addictive game, Tetris, from Spectrum Holobyte. But more on that next time. Ian Chadwick is a Toronto-based technical writer who lives in an increasingly small house with his wife, Susan, six cats, one dog, two rats and several field mice (who moved in recently, despite the cats)—and that's not to mention the neighborhood's stray cats that take up residence as the mood moves them.